With 27% high-quality protein the Power Pack Vanilla is a good protein source to support recovery after training. The optimum ratio of protein, carbs and fat also makes it ideal as a snack in between meals. Each bar is 35g. May contain traces of Soya, Gluten, Peanuts, other Nuts and Egg. Milk protein, 21.5% milk chocolate (sugar, cocoa, butter, milk powder, cocoa mass, emulsifier soya lecithins, natural vanilla flavouring), glucose syrup, fructose syrup, whey protein concentrate (milk), palm fat, collagen hydrolysate, banana powder, flavouring, salt, colour (beta carotene). 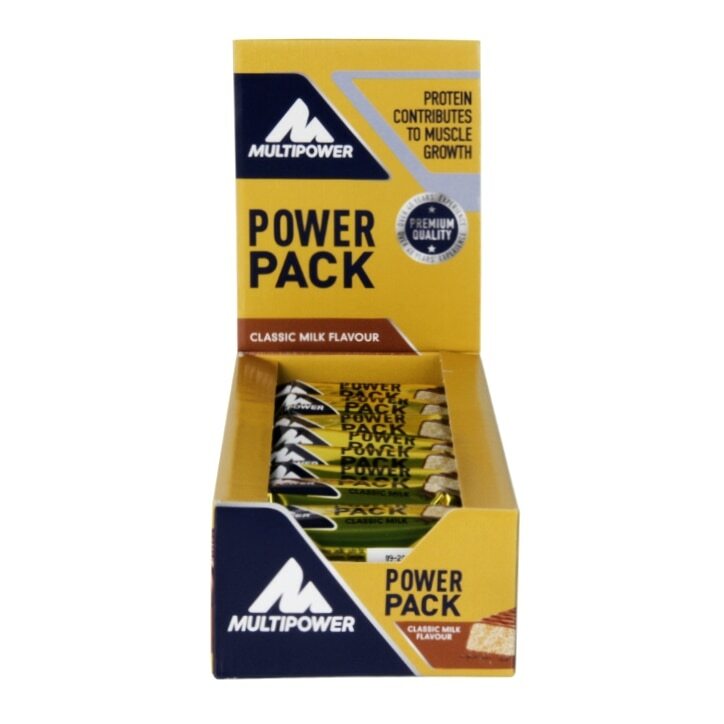 Multipower Power Pack Bar Classic Milk is rated 3.7 out of 5 by 3. Rated 5 out of 5 by Mary56 from A perfect protein snack! I love these - a low calorie 10g protein bar ideal for a snack. I have one every day.